There is nothing more conversation provoking or stylish than decorating with authentic antique furnishings. So if you have an interest in ships, sailors, and seafaring, adding these wonderful testaments of our maritime heritage to your decor is a pleasurable and inspiring experience. Used as a focal point or a theme in a traditional setting, they add incredible interest to every home or office. If you click on the item's picture, most are linked to a detailed listing. For prices, please call or send an email tor info@landandseacollection.comWe will be happy to discuss your specific requirements with you. Exceptional Quality Weight 26 lbs. To inquire about this item, click here! 43 3/4" x 16" x 5” Weight 9 lbs. 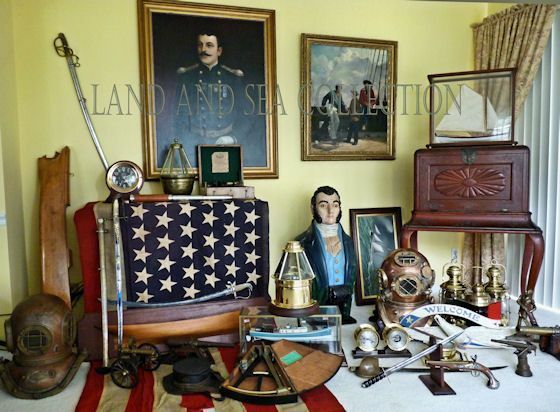 SOLD as gift to serving Naval Officer. Thank you! 13 3/4" High 5 1/4" Max Dia. Weight 3 lb. 6 oz. Rare Evinrude 1930 Fold-Light Outboard Motor Display Weight 29 lbs Compact Size Absolutely Mint Condition SOLD. Thank you! Framed 46" x 36 1/2"
SOLD to Museo del Mar (Museum of the Sea) Old San Juan, P.R.